Jackpot. I should have come to Technorati and done this search a long time ago: global women politics blogosphere (but noooo... I had to try other search techniques first). I found this blog for Antigone Magazine, a biannual print publication about women and politics at the University of British Columbia. The blog keeps the dialogue going throughout the year. It's written by several women and primarily focuses on politics in Canada, but also includes a fair amount of commentary on their neighbors to the south. There is some good content here written by women. My complaints here tend to skew to the design of the site. While a beautiful language to look at, Arabic characters do not hold up well when reversed out of this black background. Also, image placement and column widths of the site have been skewed in such a way that type runs together and runaround on photos is awkward to the point of having one word per line in the sidebar. 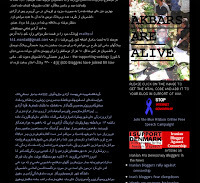 The blogroll here looks promising with many links to blogs and sites about democracy movements in Iran. The design is simply something keeping me from learning from this site.